You may love your current car or SUV, but if you have a growing family, at some point the lack of additional space may become an issue. The 2018 Honda Odyssey might be the right minivan for your family to grow into. There are several reasons why you should give some serious consideration to your next family vehicle being a new Honda Odyssey. One of the best parts about the Honda Odyssey is that you will be able to easily seat up to 8 people without sacrificing the comfort or the extra space often needed for your legs. This also gives you more space to put additional luggage in the aisles of the minivan. Another feature of the 2018 Honda Odyssey that stands out is the additional storage in the trunk. The deep trunk allows you the extra space you need for whatever it is that you are hauling without obstructing the driver’s view of the rearview mirror. The Honda Odyssey has consistently been known for its comfortable ride. The suspension in the Odyssey does a great job absorbing the bumps you will regularly encounter while driving. This will help prevent wear and tear on your tires that can occur from hitting hard bumps in the road. Lastly, the Honda Odyssey comes with some built-in technology that will assist your overall driving experience. For example, the rearview camera and a blind spot assist system will help you minimize the risk of a potential car accident. You can also utilize the Bluetooth feature so you can play music from your phone wirelessly or answer a phone call hands free. If you are interested in purchasing a 2018 Honda Odyssey make sure you visit Dalts Honda in Ontario, Canada. Just remember that the new Honda Odyssey offers an accommodating interior, an abundance of storage space and a smooth riding experience. We believe that shopping for a new car is one of the most exciting things a person can do. After all, a car is one of the most important possessions a person can have. Not only does it get you to where you want to go, but a car also says a lot about your personality. The right car for you can increase your enjoyment in life, solve the transportation issue, and be easy on your budget. That’s why we believe the 2018 Honda Civic LX is definitely worth taking a close look at. Priced to fit nearly everyone’s budget, the Honda Civic features the reliability of one of the most trusted car makers and great fuel economy. Drivers can expect to get over 40 miles a gallon on the freeway and over 30 mpg in the city. The Honda Civic comes in several trim models, including the EX, the EX-T, the EX- L, and the LX. The LX is the most basic model, but it still carries many desirable features for the discerning car buyer. The 2018 Honda Civic LX comes in a variety of colors and boasts such available features as a multi-angle rearview mirror, Bluetooth for hands free operations and streaming audio capabilities, LED daytime running lights, a 5-inch LCD screen, a capless fuel filler, and the efficient 2.0 liter 4-cylinder engine. A Honda Sensing feature suite is also available. At Dalts Honda, we take pride in matching the best car to the buyer. We want you to be satisfied with your car for as long as you own it. Toward that end, we provide a full-customer service experience, with financing, maintenance and sales. Come into our showroom and test drive any of our vehicles. Whether it is a Honda Civic or another model, we believe you can find the right car for you. The Honda Fit is known for its aerodynamic efficiency gives it a uniquely sporty look. It comes in an LX, Sport, EX and EX-L trim models. The Sport comes with a nicely accented underbody, alloy wheels, audio touchscreen display and available paddle shifters. The EX comes standard with Honda Sensing, one-touch power moonroof, Apple CarPlay and Android Auto. The top of the line EX-L includes CVT with paddle shifters, heated front seats, leather trimmed interior and an available navigation system. The 2018 Fit also offers two new colors: orange and yellow. The 2018 Honda Fit does a great job at utilizing space. The clever interior design makes for an enjoyable experience for the driver and passengers alike. It has excellent visibility and several seat configurations that allow you to optimize for any situation. Honda Sensing is a suite of technologies that enhance safety and offer driver assistance. It helps alert you to things you might miss while driving. There are many distractions in cars these days that make intelligent technology a welcome addition. Honda Sensing features a collision mitigation braking system, road departure mitigation system, adaptive cruise control and lane keeping assistant system. All models come with an in-line four-cylinder engine. The six-speed manual transmission comes delivers 130 horsepower and 14lb-ft torque. The CVT (continuously variable transmission) options deliver 128 horsepower and 113lb-ft torque. The six-speed manual transmission Fits average 31mpg combined driving, while the CVT Fits average between 33 and 36mpg combined depending on the trim package. Deciding on a new vehicle can be a daunting task. There are so many options and trims to choose from. 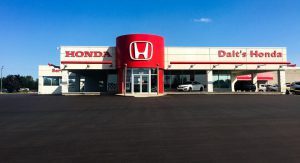 Dalts Honda excels at matching customers with the vehicle that suits their lifestyle and pocketbook. Stop by and check out all the 2018 Honda Fit Hatchback has to offer. Rearrange the seats. Test out the different tech features. Take each out for a test drive. Take the time to shop. That way you are satisfied with your ultimate buying decision. Do you feel that? Something is in the air that means another summer is behind us. The mornings feel cooler. The leaves are changing colours then falling to the ground. You know what comes next. Colder weather and then that white stuff. Take the time to enjoy the fall. Maybe it’s a good time to take a road trip. We live in an area where you can spend a day on the road and see some great views. It’s also time to think about what’s to come next and to try and be ready. One of the best things you can do is put a set of winter tires on your vehicle. If you never have, you’ll experience something that many have already. That extra feel of safety and control. It really is night and day and once you go with winter tires, you will never look back. “But it hasn’t snowed yet” you may be thinking. Many people say the same thing then when we do get that first snowfall, everyone wants to get their winter tires on at once. This can’t always be done and you may have to wait. Why not get ahead of the game and be prepared for what we all know will come. Get them done now. Avoid the wait. 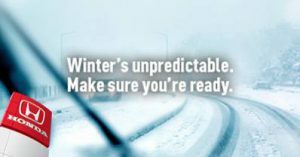 Have that peace of mind that when that first storm hits, you won’t have to worry about getting your winter tires done. You’ll be sipping your hot chocolate looking out at the snow thinking, glad I got those winters put on. Have a look at our online tire store. There you can see different options and prices for your vehicle. You can even create a package for your vehicle and then you’ll be ready to book an appointment. To read about why tires, winter or others, are important click here. There’s nothing more exciting than getting a new ride. There are many cars available on the market, but for high-quality and affordability, the 2017 Honda Civic is leading the pack. Purchasing this vehicle can be an enjoyable and stress- free experience when you visit our dealership. We go above and beyond to make sure our customers get the best deal. Not only is a Honda Civic one of the classiest cars available, but its mechanics are comparable to its sleek and modern design. Owners can take advantage of a six-speed manual transmission, remote engine start, a power roof and even heated seats. Whether you’re a solo driver or someone looking for safe transportation for your family, you don’t have to compromise looks for dependability. No matter your financial situation, you can get a Dalts Honda at a fair price. Our representatives strive to set up all customers with a payment plan that suits them. Signing up is an easy and carefree process. Any questions you have will be answered promptly and you’ll be given space to read the fine print with no hassle. Options include longer repayment plans with little down, or shorter repayment terms for a larger amount upfront. We want you to walk away from our dealership with a car you love and an experience you can recommend to your friends. Our sales staff is both knowledgeable and friendly. You certainly don’t have to be familiar with Honda Civics to make the most prudent purchasing decision; we’ll be by your side every step of the way. We strive to provide five-star service along with affordable prices for every customer that walks through our doors. Get ready to turn heads with your stellar Honda Civic. Don’t hesitate to browse our inventory today so we can get to work providing you with a car you’ll love for years to come. We are excited to say that we are done with the lot paving. It was a bit of a pain to go through but we had a lot of help from our great pavers, Ital Paving. They were really good to work with and we would recommend them for any of your paving needs.